As I’m sure you recall from previous articles, I am attending as a speaker the Finding Your Niche/Expanding Your Horizons conference that begins Friday in Rochester, NY. If you are still waffling about coming, stop waffling and join your colleagues for what promises to be a very informative conference. As the expression goes, there is still room at the inn (and at the conference). Here is a link for information and for registration. A key aspect to increasing your earning power as a freelance editor is mastery of macros and several well-known Word macro gurus will be presenting and in attendance. It will be a golden opportunity to pick the minds of some of the leading editorial freelancers. Anyway, the primary purpose of this note is to remind you that I am attending the conference and will be away beginning tomorrow (Thursday, September 30) and returning next Thursday (October 7). Consequently the chances of my writing and releasing new articles during the next 7 to 10 days are not very high. It might happen, but if it doesn’t, hang in — I don’t want you to think I have simply disappeared — I’m just soaking up knowledge and friendship. For those of you who do not subscribe but prefer to click a link to check out An American Editor daily, I suggest you continue to do so. If at all possible, I will be posting during this absence from my office. You and I will reconnect in the not-too-distant future; until then, enjoy the change from summer to fall. The election season is now in full swing with the primaries over and only a few weeks to a shorter-than-usual campaign season. I guess there are still some things one can be thankful for. But this campaign season differs from past seasons in one major respect — not since the Civil Rights legislation of the 1960s can I recall a campaign in which so many candidates are running on the vote-for-me-to-repeal issue, which, in today’s case, means repeal of the recently enacted healthcare legislation. An underpinning argument made by opponents to healthcare is that it will result in Xyz-style (substitute country of your choice for Xyz) rationing of medical resources. I guess I must live on a different planet because of all the possible arguments against the healthcare legislation and of all the possible reasons to support its repeal or modification, this is the weakest argument. But, then, we need to consider the circumstances of those who are making the argument of rationing — it is hard to see millionaires like Mitch McConnell who also happen to have gold-plated medical insurance at someone else’s expense (yes, I know he pays a monthly contribution, but that is all it is — a contribution; the bulk of the cost is borne by those of us who do not have access to that gold-plated plan, and often have no access to any plan, gold-plated or lead-plated) even knowing what medical rationing really means. What brings this to mind is a story in yesterday’s newspaper titled “$93,000 cancer drug: How much is a life worth?” This article demonstrates the conundrum of medical rationing in America. Provenge is a new, unique cancer drug. A patient receives it once and that one-time treatment costs $93,000. In return, a patient, on average, gains 4 months of life. The patient interviewed in the article who received the treatment put the issue out front: “Bob Svenson is honest about why he got it: Insurance paid. ‘I would not spend that money’ because the benefit doesn’t seem worth it, [said] Svenson, 80,….” The insurance that is paying for it is his supplemental Medicare plan — until Medicare itself decides whether the drug will be paid for and for whom. Provenge has several problems as regards rationing: (1) the drug is in short supply because it has to be made uniquely for each patient; it can’t be mass produced, and (2) it is an all-or-nothing $93,000 gamble because it can only be given once and there is no assurance it will work in a particular patient. As regards the short supply, doctors at the University of Texas’ M.D. Anderson Cancer Center plan a lottery to see who of the otherwise eligible patients will receive the treatment (there are approximately 150 eligible patients at the Center but only 2 can receive treatment). None of this rationing is brought about by the new health legislation; in fact, if anything, the new health legislation has broadened the pool of people who will be eligible for such treatment because it will broaden the number of insured. So exactly how does the healthcare legislation cause rationing? The usual focus once one gets past drugs is on access to doctors. You might have to wait to see your doctor. Hmmm — I believe we already see that. Try getting in to see a specialist, or even your primary care doctor immediately. Except in an emergency (and then they usually tell you to go to the emergency room at the hospital), appointments are made 2 to 4 weeks or even longer down the road. I suffer this wait, my neighbors suffer this wait, my friends suffer this wait. Maybe the problem is that I don’t have Republican branded on my forehead because if I listen to the Republicans, I don’t have to wait unlike in Britain or Canada. Again, I think the problem is that they have immediate access to Walter Reed Hospital as VIPs, something I can’t get. I’m also told that part of the rationing will be a loss of choice of doctors. Huh? The only way such a statement makes any sense whatsoever is this: Either the government-sponsored and taxpayer-funded health plans they have will pay for treatment given by any doctor or hospital on the planet or they are paying the full cost out of pocket. I know in my case, my plan limits me to doctors who participate in the plan. Doesn’t matter if another doctor is better or less expensive, if the doctor isn’t in the plan, my insurance doesn’t cover any visits. As for paying out of pocket, well I’m already paying out of pocket $1500 a month between insurance premiums, doctor copays, and drug copays, which stretches my budget; I just don’t have the resources our elected representatives seem to have. The rationing is being done by the “private” marketplace — the insurance company who tells me who I can see based on whether or not the insurance company was able to cut a financial agreement with a doctor and by how much money I can earn and devote towards medical treatment and bills. And before the new healthcare legislation, if I found that my financial circumstances had changed and I could no longer afford insurance premiums, I could have been excluded from ever getting insurance again because of preexisting conditions. Seems to me that that is much more egregious form of rationing than what is done in the more level playing fields of Britain and Canada and what is feared by healthcare opponents in the United States. When really analyzed, the rationing argument boils down to this: The people trying to convince us of the evils of government legislation on healthcare are the people who will always walk outside the restrictions of any such legislation because of wealth and connections. They are the people who stand to gain personally from the failure to provide the majority of citizens with decent healthcare. Why is it alright for the private marketplace to ration Provenge but not for the government? I don’t mind their being opposed to healthcare legislation; I just want them to be honest about why. Treat us more like equals than like sheep; give up their perks and privileges so that they have to deal with the situation as ordinary folk do. Take us back to our founding roots — “All men are created equal” except those that have and those that have not. In an earlier article, Why, Microsoft, Do You Insist On Torturing Me?, I discussed my frustration with the Microsoft ribbon that is being forced on me by Office 2010. I also discussed my moving from Windows XP to Windows 7. I thought it appropriate to give an update, as well as introduce you to an inexpensive bit of software that greatly eases my Office frustrations: Toolbar Toggle. Let’s start with Windows 7. I’ve been using it for several weeks now, and all I can say is Wow! Great! Excellent! I think with Windows 7 you can throw any accolade you want at it and the accolade will stick. Win 7 has been an absolute delight. This coming weekend, my computer goes back into the shop for another Win 7 changeover. To go from XP to Win 7 without doing a clean install, I had to upgrade to Win 7 32-bit. Knowing that ultimately I want a 64-bit system, I converted all of my hard drives to “hot-swappable” hard drives (which means I can simply pull out one hard drive and plug in another). Now, while I’m at the Finding Your Niche Conference (see A Reminder: The Finding Your Niche Conference) this coming weekend, my local computer shop will prepare a new hot-swappable hard drive for me that is Win 7 64-bit. This will allow me to gradually set up the 64-bit system for work yet allow me to continue to earn a living by working on the 32-bit system. Although Win 7 was a great success and I highly recommend it, Office 2010 was more problematic. installation went smoothly, but I have problems using the ribbon system efficiently. I need to learn to modify it and accommodate to it, and Toolbar Toggle is helping me make that transition. I skipped Office 2007 because of the ribbons and the inability to easily customize them. In this regard, Office 2010 is a big improvement — the ribbons are somewhat customizable and what customizing can be done is easy to do. But I still hate the ribbons. It has increased the number of steps I need to take to get a task done and it changes a work style that I have learned over 25+ years of Microsoft Office use. But change does come and one has to learn to deal with it. I haven’t completely left Word 2003 (I have left completely Excel 2003, Outlook 2003, and PowerPoint 2003 for their 2010 counterparts; it is just Word, my daily workhorse that I haven’t yet abandoned) because I can get my work done much more efficiently in Word 2003 than in Word 2010. But my abandonment of Word 2003 will happen in the next couple of weeks thanks to Toolbar Toggle. Toolbar Toggle gives me my Word 2003 menu system in Word 2010 (it also does the same for Excel and PowerPoint, but I personally don’t feel the need for it in those programs). It doesn’t do away with the ribbon system, it complements it by making both available (or you can hide one or the other). Toolbar Toggle is fully customizable, just like the toolbars in Word 2003. Consequently, as I am learning to adjust to the new Word system, I can fall back on the old system. It’s a crutch for those who are like me and are uncomfortable with the ribbon system. I keep both the ribbon and the Word 2003-style toolbar visible as I work in Word 2010. I try to use the ribbon system as much as I can, and am constantly tweaking it to get it to conform to my way of working, but rather than curse at my computer and want to punch out Word 2010 because I’m frustrated with the ribbon system, I just go to the Toolbar Toggle Word 2003 toolbar and move on. Toolbar Toggle is inexpensive. There are two versions, a Lite and Full (what I call Pro). A single-user license for the Lite costs $12.95 and $19.95 for the Full. The Full version also includes a license for the Lite version and can be installed on 2 computers, covering both your desktop and laptop, for example, for $19.95. A comparison of the two versions is found here. One major difference is that the Lite version becomes part of the ribbon whereas the Full creates its own toolbar below the ribbon. You can see a demo of Toolbar Toggle here. And some good news: Until October 31, 2010, you can buy the Full version with a 20% discount. At checkout, just enter the code NICHE20OFF. Toolbar Toggle tech support is absolutely fantastic. I had some questions in the beginning about customization and sent off an e-mail; within hours I had a reply. If you are struggling with the transition to Office 2007/2010 or have put off making the transition because of the ribbon and not wanting to forsake the menu system of Offices 2003 and earlier, then this is the add-on for you. I have found it invaluable and the price is hard to beat for the help it provides. I view Toolbar Toggle as a must-have add-on for Office 2010 so as to be able to keep up with my work flow as I transition to the new ribbon system. In addition, it is a great complement to the Editorium, EditTools, and PerfectIt macros discussed in The 3 Stages of Copyediting: I — The Processing Stage, II — The Copyediting Stage, and III — The Proofing Stage, respectively, because it makes my editing work easier to do. There is always a lot of discussion about which screen is better for reading ebooks: and LCD screen, which is often less expensive, or eInk-type screens, which are often more expensive. Interestingly, the arguments often revolve around eyestrain, but I’m not so sure that is the real separator. Today, editors rarely work on paper. We all almost always read and edit manuscripts on monitors. Some editors still cling to the older CRT (cathode ray tube) technology — I still remember trying to fit 3 CRT monitors on my desk — but nearly all have gone modern and use a LCD monitor. I can’t remember the last time I edited — or was asked to edit — a manuscript on paper. I do know that once I realized the value of editing on my computer, I turned down work that was paper based, and that was in 1985! I work all day reading on my LCD monitors. I grant that at the end of the workday I am tired, but my eyes aren’t tired — well, no more tired than they would be had I spent the day reading paper or eInk. I don’t find LCD to be eyestraining. But having said that, I still do not want to pick up a LCD ereading device. I find the eInk screen soothingly dull (and dull should be taken as a positive, not a negative attribute here). No matter how I view it, my LCD monitors do “push” at my eyes with their brightness and glare. True, I have adjusted the monitors so that the brightness and contrast are balanced for my eyes, but even so, there is still that stream of light that comes out of the monitor, aimed at my eyes. Another problem with the LCD for reading ebooks is that its backlighting, while suitable for reading where there is no other light source, is unsuitable for reading in sunlight — it simply washes out. eInk lacks backlighting, just as a book lacks a lighting source, and so it does not wash out in sunlight. Consequently, with my eInk screen I can read while reclining in my hammock or when we go to the park or the pool, but I need a light source to read in bed. But in the end, I’m not sure that which screen technology is used makes much of a difference, at least as far as eyestrain is concerned. Few people I know will spend 4 or 5 hours a day reading for pleasure; most spend an hour or 2 on their ereading devices. And how often does one have time to loll around the pool or enjoy the hammock (actually, I find the hammock so relaxing that I end up falling asleep rather than reading). The real issue is what experience you want to mimic. It is the aesthetics that dominate, I think. I prefer the eInk screen because it is a closer mimic of the paper book reading experience, an experience I enjoy and want ebooks to emulate. I have a hard time thinking of ebooks as something other than another form of a pbook; I should really separate the two completely and develop an ebook-only perspective, but I think that is difficult for my generation or for any generation that grew up with pbooks. The newest generation will make that separation much more easily and naturally because it will have been weaned on ebooks. If you find that at the end of the workday you could continue reading on a LCD screen, then consider an ereading device with a LCD screen; they tend to be less expensive than their eInk counterparts. The only significant negative is the difference in how long a battery charge will last; an LCD’s battery life is generally measured in single-digit hours whereas an eInk device’s battery life is measured in weeks. At least for today, LCD offers the advantage of color; eInk is currently black and white, although color is in the future. I, however, plan to continue investing in eInk. I expect my next device to be the forthcoming Sony PRS-950, which is due to be released in November. I want my ebook reading experience to mimic my pbook reading experience as much as possible. We’ve had musical interludes before (and will again in the not too distant future), but I thought I would expand our horizons a little and venture at least a toes’ worth into the world of art. Share the Joy — Read (2010) was commissioned as a gift for the Ramsey, NJ, public library in celebration of its reopening after renovation, where it will go on permanent display. 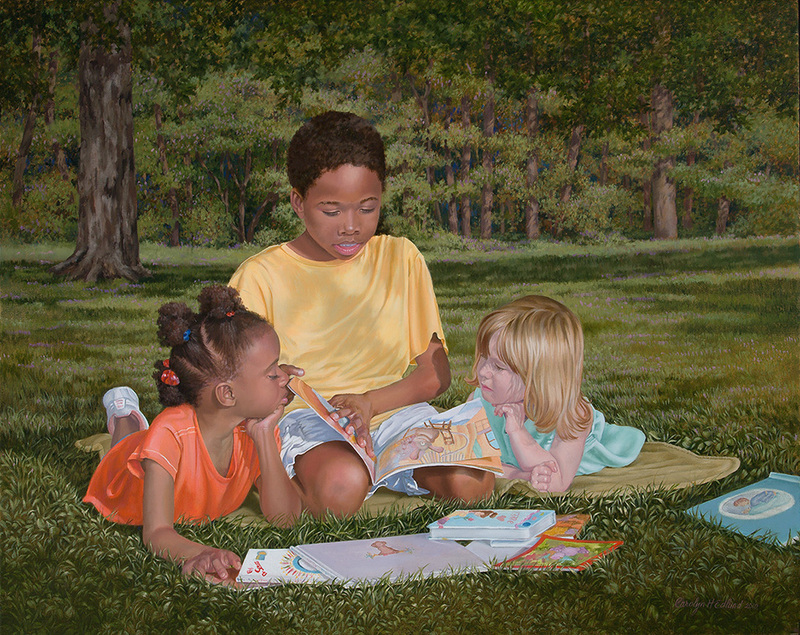 Share the Joy — Read is 24 x 30 inches oil on linen. Carolyn has been doing portraiture work for years. 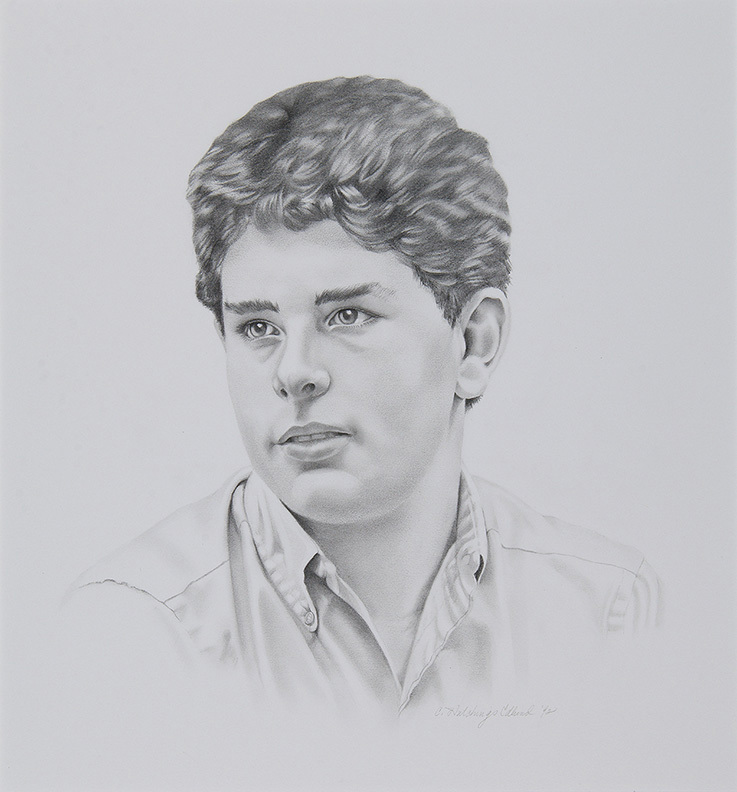 A sample of an earlier work is this portrait of an adolescent boy, which is a graphite portrait done on paper and is from 1992. The watercolor below is a more recent portrait done By Carolyn. The subject is the daughter of one of our freelancer colleagures. Enjoy these works of art. In future Art Interludes, I’ll showcase some other works by Carolyn. 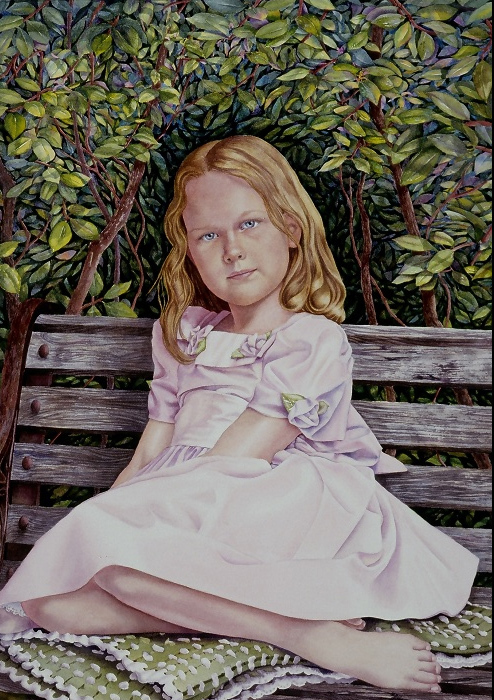 For more information about Carolyn’s artwork, visit her website, www.carolynedlund.com. She can also be contacted through her website. I’ve been thinking about the errors I find in ebooks. Sometimes they are small errors, the kind I would find even in a well-edited pbook, the occasional dropped article, the switch in tense, and the like. Nothing too serious, but noticeable. Annoying but forgivable, at least on some low level. After all, perfection is something we strive for but rarely attain. As I thought about these errors, I also wondered whether I was more sensitive to them in ebooks. I’m not talking about the repeated big errors such as those I discussed in On Words & eBooks: Give Me a Brake! or in Truman & MacArthur & Why a Good Editor is Important; again, I’m talking about the small errors, the errors that I, and most readers, would pass over without much thought — well, maybe a grimace or two — in pbooks; errors we wouldn’t dwell on and write 1000-word discourses lambasting the book, the author, the publisher, or the editor. Yet, these low-level errors seem to annoy me more when I come across them in an ebook. That led me to wonder why these errors are so much more noticeable and annoying in ebooks than in pbooks. I think I have found the answer: The small screen of most ebook reading devices (generally 6 inches or less) limits the amount of text we see at one time (both directly and peripherally), especially when we enlarge the text to make it easier to read, thus emphasizing the text before us. What does this mean? It means that errors are more noticeable by and more annoying to readers in ebooks. What might be overlooked in pbooks is not overlooked in ebooks. It means that the editor’s role in preparing an ebook for publication is even more important than it is in preparing the same book but for pbook distribution. It also means that a final proofread should be performed on an ebook reading device — it should mimic the reader’s reading experience. It is this last step that is missing. Yesterday I complained about it as regards important illustrations (see The Problem Is: Publishers Don’t Read eBooks!) but the more I think about it, the more I realize that the switch to digital reading requires the addition of another step in the publishing process — the step of ensuring that the converted digital file is readable. As one of the comments to yesterday’s post noted, the current process seems to be that that a digital file (hopefully the same digital file that was used to print the pbook and not a scan file, especially an unproofed scan file) is simply sent to a producer like Amazon who then undertakes the conversion process. This takes the file out of the publisher’s hands and into a third-party’s hands, a third party whose name doesn’t appear in the credits of the book and who is not the target of consumer anger if the ebook file is riddled with errors. Perhaps this is the wrong approach to the conversion process. This ebook was created by Amazon, which is solely responsible for any errors related to readability found in this ebook that are not also found in the original print edition. Complaints about formatting, dropped, missing, or incorrect characters, and other readability issues should be addressed to Amazon at __________. Seems to me that would put the blame where it belongs. It also would identify where the problem source is and allow consumers to pressure the right party. This book has been optimized for reading on a 6-inch-screen reading device by having a prerelease proofread performed by a certified digital proofreader on a 6-inch-screen reading device. The proofread was conducted on such a device as part of the process. Errors that have been introduced during the conversion process are the responsibility of ______, the conversion processor, and should be addressed to _______. This is almost a warranty of quality, something I suggested quite some time ago (see A Modest Proposal II: Book Warranty). But think of what this would do, the effects it would have. First, it would establish a minimum level of quality, something that readers could grasp and depend on. Second, it would eliminate a good deal of consumer dissatisfaction. Third, it would put the burden on the company doing the converting to improve the conversion process in an attempt to make it error-free. Fourth, it would add value to ebooks. If the publisher itself does the converting, that is, creates the final digital file that will be sold to the consumer, the following statement could be included with the Certificate of Optimization. Although we strive for perfection, should you find an error, please advise us of it by e-mailing us at __________. We will endeavor to include appropriate corrections in future releases of the digital files for this book. Imagine the goodwill this would engender as increasingly error-free ebook versions are made available. And if a publisher has to do this often enough, the publisher is likely to invest more upfront to get it right the first time, perhaps eventually leading ebooks into the error-free zone. Perhaps the time has come to identify who is responsible for the errors we find when we read an ebook and to pressure that entity to work toward an enhanced reading experience. The Problem Is: Publishers Don’t Read eBooks! Okay, I admit I don’t know that 100% of publishers don’t read their own ebooks — heck, I can’t even swear with certainty that publishers even know how to read — but I am certain Tom Doherty Associates/TOR/Macmillan’s publisher didn’t read the ebook version of Brandon Sanderson’s new release The Way of Kings before releasing it on the unsuspecting public. What gives me a clue that the publisher probably didn’t read the ebook version before release — and probably neither did the book’s editor nor Sanderson — are the illustrations. At the opening of the book, in the front matter that few readers read, but which I do (yes, I’m peculiar in this regard; I tend to read every page of a book — including the copyright page and the dedications and acknowledgments, as well as every footnote/endnote, which is why footnotes and endnotes are such a sore point with me [see, e.g., Footnotes, Endnotes, & References: Uses & Abuses]), Sanderson makes a big deal about the illustrations. As it turns out, he is right to do so — or at least I think he is; I can’t tell — I can’t read them, and if I can’t read them, neither can the publisher, the editor, nor Sanderson, which leads me to believe none of them read the book in its ebook form before releasing it for me to buy. One example: In one of the stories/chapters, the characters discuss “the Code” that governs military men — or at least the righteous military men. The code that a dead king lived by and his brother lives by and wants his son to live by. But where is “the Code” outlined for the reader? In an illustration that cannot be read! This is the problem with ebooks. Publishers, editors, and authors treat them as Cinderella stepchildren — as a way to do the work of increasing revenues without being given an opportunity to shine on their own — you know, scrub my floors, make them shine, but don’t walk on them. The consequence is that what should be an excellent reading experience becomes an annoying one. The neglect becomes evident, and the $14.99 the publisher demands for the ebook version becomes a sore point. In my case, it becomes a double sore point because I bought both the hardcover version (where the illustrations are readable) and the ebook version, as I noted in The Lure of eBooks: Gotcha!. I might have done this again with another TOR/Macmillan book, albeit reluctantly, but now you can bet I won’t. Rip me off once, shame on you; rip me off twice, shame on me! Alright (before complaining and saying it’s “all right”, see On Words: Alright and All Right), we know that Macmillan really hopes ebooks don’t succeed but it’s time to recognize that that battle is lost — ebooks are here to stay and represent a growth opportunity for traditional publishers if done right. It’s getting to the done right part that appears to be difficult. To do ebooks right means one cannot simply take the pbook version, convert the electronic files used to create it to ePub, and declare we have an ebook. Instead, before the declaration of success, someone needs to read the “ebook” carefully to make sure that not only is it not riddled with the types of errors that show an uncaring, amateur job (see, e.g., On Words & eBooks: Give Me a Brake!) but that items like illustrations are recreated to fit the parameters of ereading devices. I understand if an illustration can’t be made readable on every cell phone screen — there certainly does come a point when a screen is simply too small — but there is no excuse for not making illustrations readable on the “standard” 6-inch eInk screen. The only excuses are laziness and a disinterest in making the customer’s experience a positive one. Haven’t the Agency 5 already done enough to alienate the consumer with its pricing model? Must it shove the blade in deeper with a twist by also ensuring that important elements of a book cannot be read? The cynic in me says that TOR/Macmillan did this deliberately with Sanderson’s book — an attempt to get consumers to buy both the ebook and pbook versions. But I really do know better. It wasn’t deliberate in that sense; rather it was deliberate in the sense that Macmillan is still trying to fight the battle it has lost and cannot ever reverse the tide of — the rise of ebooks at the expense of pbooks — and by a deliberate policy of not caring enough to have the publisher, the editor, or even the author read a prerelease ebook version on a standard 6-inch eInk device. I will think at least twice, probably many more times than twice, in the future before I buy another TOR/Macmillan ebook, especially one at any price higher than $5.99, because as I said before: rip me off once, shame on you; rip me off twice, shame on me — and leaving important illustrations unreadable is a rip off at $14.99!